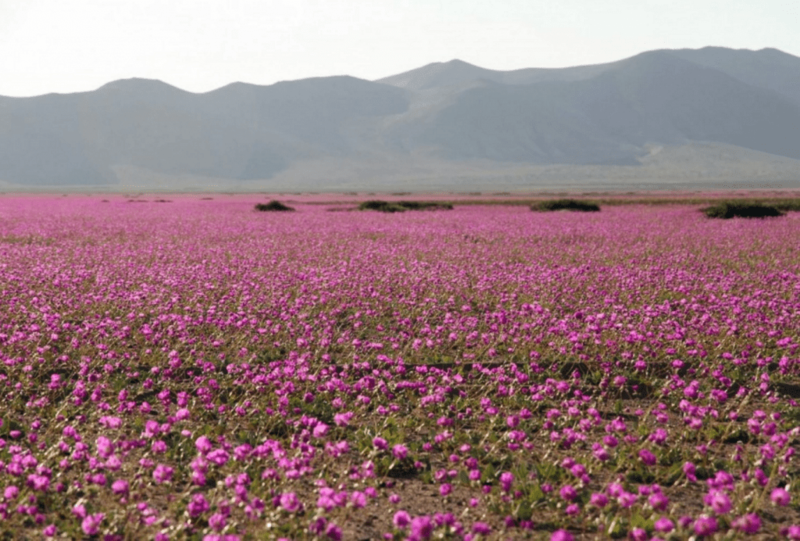 You wouldn’t usually describe the Atacama desert — the driest place on Earth — as vibrant with life and colourful. Far from it. For the second time this year, however, the desert bloomed as thousands of dormant species of flowers and plants awoke after El Niño brought a rainy boom to the region. The Atacama Desert in Chile is a (typically) rainless plateau that covers almost a 600 mile location that’s 50 times drier than Death Valley. The average rain fall in the region is just one millimeter per year and in the early 20th century not one single drop of rain reached Atacama’s surface for 173 months. In fact, it’s so dead, barren and, well, alien that NASA regularly conducts tests here simulating conditions on Mars. Atacama isn’t quite dead, and if anything it’s quite a testimony to the resilience of life. Beneath the sterile soil lie dormant flower bulbs and rhizomes which explode when give the opportunity. This is what happened very recently when a new gush of rainfall swept the area driven by El Niño – a band of anomalously warm ocean water temperatures that periodically develop off the Pacific coast of South America causing pattern of extreme weather events. Floods and droughts are regular in the onset of El Niño which surfaces every couple of years or so. This year’s El Niño is poised to be the strongest since 1950. “When you think of the desert, you think of total dryness, but there’s a latent ecosystem here just waiting for certain conditions to arise,” said Raul Cespedes, a desert specialist at the University of Atacama. In March, heavy rains caused floods in the vicinity which tragically killed 30 people. It also caused a massive bloom. The desert is now blooming for the second time this year, which makes it quite the anomaly. “Two flowerings a year is very unusual in the most arid desert in the world, and that’s something we’ve been able to enjoy this spring, along with people from all over the world. There’s a lot of interest in seeing it,” said Daniel Diaz, director of the National Tourism Service for Atacama region.